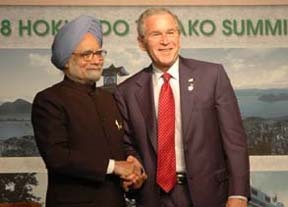 9 July:Prime Minister Manmohan Singh and President George W Bush held detailed discussions on the Indo-US nuclear deal on Wednesday after which both leaders affirmed that the agreement was important for the two countries. The two leaders spoke in unison on strengthening the bilateral "strategic relationship" after Singh drove more than 100 km from Sapporo at dawn to meet Bush at Hotel Windsor on the picturesque Mt Poromoi in Hokkaido island, where the G-8 leaders are meeting for their annual summit. During an extended 50-minute meeting which took place hours before the Left parties formally withdrew support to the UPA government on the nuclear deal, Bush said he "respected" Singh "a lot" and congratulated the Indian Prime Minister for his "leadership at home". "It was a really good meeting amongst two friends. And so, Mr. Prime Minister, thank you for joining us today, and congratulations on your leadership at home," Bush said in a remark that reflected the camaraderie the two leaders have developed over a series of meetings. The body language of the two leaders, the warm handshake they exchanged and highly appreciative words they used for each other clearly reflected the commitment both sides have in seeing the nuclear deal go through fast, given the time constraints. "We talked about the nuclear deal–how important that is for our respective countries," was all Bush said in clear reference to the agreement the two leaders had reached on civilian nuclear agreement almost three years ago. The Prime Minister spoke of the "progress" made between the two countries in several areas including nuclear, defence, space and education. Singh had told journalists on way to Sapporo that he would discuss with Bush and other influential leaders of the G-8, who are also members of the Nuclear Suppliers Group that he would take up with them the issue of carrying forward the processes in IAEA and NSG. Bush described the meeting "as a conversation among friends" and added, "I respect the Prime Minister a lot. I also respect India a lot. I think it’s very important that the United States continues to work with our friend to develop not only a new strategic partnership, but a relationship that addresses some of the world’s problems." The Prime Minister responded in adequate measure praising Bush’s "magnificent" contribution to the bilateral relationship between the two countries which, he said, had moved "handsomely" forward in all areas since their first meeting in July, 2005 when they agreed on the civilian nuclear engagement, and had "truly acquired the characteristics of a genuine strategic partnership". "Our relationship has never been in such good shape as it is today…. It is the intention of my government, as I believe it is also the will of the Indian people particularly the thinking segments of the people that in this increasingly interdependent world that we live in whether it is the question of climate change or managing the global economy India and US must work together shoulder to shoulder, and that is what is going to happen". Singh said the two countries were working together in multilateral institutions for the success of the Doha. "And I am very pleased with the state of our relationship, which has truly acquired the characteristic of a genuine strategic partnership," the Prime Minister said. The leaders made the remarks after the meeting but took no questions.Bush said the two had discussed how their countries could work together to grow each other’s economies and at the same time be responsible towards environment. "We talked about free trade, the Doha Round and how important it is that nations such as India and United States find common ground to make sure protectionist sentiments don’t wall us off from the rest of the world," Bush said.